Photo by Rijksdienst voor het Cultureel Erfgoed. Akkrum is a village in the Dutch province of Friesland, south of Leeuwarden, and the seat of a Mennonite congregation. Historical information about this congregation is very scarce. Elder Leenaert Bouwens baptized five persons here between 1563 and 1565. The date of the origin of the congregation is uncertain; but by about 1660 there was a church here; perhaps also a church already standing was enlarged in 1677. 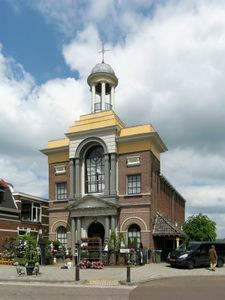 The congregation, which like most of the congregations in Friesland belonged to the Lamist wing, joined the Friesche Doopsgezinde Societeit in 1695 and had at that time eighty-seven members who did not receive support. In the eighteenth century some difficulties arose, when a Moravian Brethren (Herrnhuter) congregation was organized here, whose leaders were the clothier Johann Lorenz (1742-1769), and after him Johann Wilhelm Zander, Menno Abels and Johann Gottlieb Reimann. It attracted some of the members from the Mennonite congregation; the Mennonites complained about this matter in a letter to the Lamist congregation in Amsterdam. About 1797 the Herrnhuter congregation died out; the remaining members united with the Mennonites. During the eighteenth and nineteenth centuries the van der Goot and Hylkema families were very numerous in this congregation. 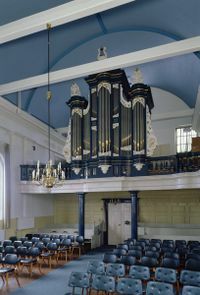 In the eighteenth century the congregation still had lay preachers, usually three or four at a time; Djurre Sakes (Veenstra) was the last of these; from 1789 to 1825, more than thirty seven years, he served the congregation, which grew to such an extent that the church had to be enlarged in 1822. After his death the congregation called Sytze K. de Waard, 1826-1838, the first preacher who had received a theological education at the seminary in Amsterdam; he was followed by Bartel van Geuns, 1829-1830. Then came Steven Blaupot ten Cate 1830-1839; during his ministry a new church was built in 1835 and the Ring (district) Akkrum organized in 1837. During this century the congregation began to flourish. In 1830 the membership was 209; in 1838 it was 321; 1861 it was 403; in 1898 it reached its high point with 439 members; then it began to decline. In 1950 it had 180 members. Following Blaupot ten Cate the congregation was served by A. A. Hulshoff, 1839-1845; S. Hoekstra Bzn, 1845-1852; Adr. Loosjes, 1853-1854; J. Visscher, 1855-1885; S. Wartena, Jr., 1886-1897; D. Kossen, 1898-1913; J. Kooiman, 1914-1923; A. Keuter, 1925-1928; S. I. van der Meulen, 1929-1943; G. M. Rosters, 1944-1947, and J. Nooter after 1949. In 1955 the congregation had organizations for the women and youth and a Sunday school for the children. There was in Akkrum a home for the aged known as "Coopersburg," erected in 1900. The home was the gift of the American Folkert H. Cooper, who emigrated from Akkrum about 1875 and made his fortune in America. He dedicated the building to the memory of his parents Willem Harmens Kuiper and IJtje Rommerts de Vries, who were members of the Mennonite Church of Akkrum. F. H. Cooper died in 1904 and was buried with his wife in the garden behind the home. The home had twenty-two rooms for Akkrum residents, preferably married couples of the age of sixty or older, who could be admitted without cost. No distinction was made between Mennonites and non-Mennonites. The Mennonite pastor of Akkrum was a member of the board managing the foundation. Cate, Steven Blaupot ten. Geschiedenis der Doopsgezinden in Friesland. Leeuwarden: W. Eekhoff, 1839. Doopsgezinde Bijdragen (1885): 68, 90. Hege, Christian and Christian Neff. Mennonitisches Lexikon, 4 vols. Frankfurt & Weierhof: Hege; Karlsruhe: Schneider, 1913-1967: v. I, 15 f.
Hoop Scheffer, Jacob Gijsbert de. Inventaris der Archiefstukken berustende bij de Vereenigde Doopsgezinde Gemeente to Amsterdam, 2 vols. Amsterdam: Uitgegeven en ten geschenke aangeboden door den Kerkeraad dier Gemeente, 1883-1884: v. II, No. 1453. Lutjeharms, W. Het philadelphisch-oecumenisch streven der hernhutters in de Nederlanden in de achttiende eeuw. Zeist : Zendingsgenootschap der Evang. Broedergemeente, 1935: 64, 83-84. Meulen, S. I. van der. Feestrede 16 Juni 1935. Zijpp, Nanne van der. "Akkrum (Friesland, Netherlands)." Global Anabaptist Mennonite Encyclopedia Online. 1955. Web. 21 Apr 2019. http://gameo.org/index.php?title=Akkrum_(Friesland,_Netherlands)&oldid=144681. Zijpp, Nanne van der. (1955). Akkrum (Friesland, Netherlands). Global Anabaptist Mennonite Encyclopedia Online. Retrieved 21 April 2019, from http://gameo.org/index.php?title=Akkrum_(Friesland,_Netherlands)&oldid=144681. Adapted by permission of Herald Press, Harrisonburg, Virginia, from Mennonite Encyclopedia, Vol. 1, p. 29. All rights reserved.